On the last day of the bike trip, I woke up at 5:30 with a groggy head. I packed up my things, leaving behind all unnecessary items. I threw out about ten punctured tubes that had collected at the bottom of my bag and took out my tent and sleeping bag, which Jeff had offered to return when he came home for Christmas. As appreciation for Jeff’s hospitality, I also left behind a grocery bag full of ramen noodle reserves. I took off from Jeff’s place at around 7:00 making my way through downtown Charlottesville and past the campus. I got back on 29 and settled into my day. I knew these last miles were going to be difficult ones. I didn’t feel great and had no room for error with 29’s steady traffic whispering into ear. All thoughts focused on home. I imagined my street, the slow last pedals. My family, warmth, rest. Rather than cheer me up, these thoughts depressed me. Just a day of biking felt too far from home. I wanted it now. With a hundred or so miles to go, I worried about not making it home before night and that my family would have to come pick me up. At least once a day for the whole trip, I had pictured biking right up to my house. I had painted this scene so vividly and for so long that any deviation from my imagined homecoming would have crushed me. I could make it home in two days easy, but spending another night outside so close to the end seemed pointless. I decided I would go as far as I could and when it came time to make the call, I’d make the call. Halfway through my day, I stopped for lunch in Culpeper. I ate three pizza slices at a gas station and after ten minutes of rest got back on the bike. As I got closer to home, traffic worsened. In the rush hour swarm, I felt very out of place. I had spent most of the trip biking alongside gorgeous forests, beneath mountains and had considered myself a free and natural extension of the landscape. Now the scene had suddenly changed and I viewed myself from the perspective of commuting cars, a lone, mad biker. My anticipation for home and sweet motionlessness stirred up desperate feelings. I wanted it all to end so badly. I was not wistful during these last miles at all. The weather was overcast and windy; the roads congested and dangerous. I had pushed my season, I had pushed my route and I had pushed myself farther than I should have. It was time for the trip to end. Outside of Warrenton, the Clark Brother’s Gun Store with the bear figurine mounted on the roof came into view. I knew I was close. The map I carried was not detailed enough to trace a clear route home, so when I reached I-66, I turned onto it as my only known recourse. I actually felt safer on 66 then on 29. There was a wide shoulder that let me bike a safe distance from traffic. I got a few miles down the road before I saw red lights flashing in my bike mirror. I explained my situation to the puzzled officer with whatever shred of sanity I had left. He seemed impressed but said four people had already called about me and he couldn’t let me continue on the interstate. I took the exit towards Manassas and stopped at a McDonald’s to wrestle with a brief moment of defeat. Sad as it is, I didn’t know how to get home from here. I could navigate my way across the country, but when it came to my own backyard, I was lost. I didn’t want to call home for directions because I knew my family would insist on coming to pick me up, so I walked across the street to a Holiday Inn. The woman at the front desk was on a phone call. She kept talking without acknowledging me. Daylight was burning. I looked around the lobby for some pamphlet or map to show me the way and saw on the wall a big road map of Northern Virginia. With my finger, I traced my way back home following 29 past the Bull Run battle field. From there I could make a right onto 50 and pick up West Ox road which would take me all the way home. The last miles were never ending. I raced with the light, putting more effort into these swan song miles than I had any other. Pulling onto West Ox road a feeling of great security greeted me. I was not home, but this was the last stretch. It was dark now. I road on a sidewalk past the Costco, the Silver Dinner, Fairfax Town Center- the old sights and landmarks nodding to me in recollection. I felt like Rip Van Winkle coming home after a 100 years nap. On Bennett road, I took caution to look behind me every few seconds, checking for headlights. It was past five now. Totally dark. No cars came. I knew I was close, but did not rest easy until I turned onto a side street into my neighborhood. Leading into my neighborhood, I did the trip’s last hill. At the top, I took off my biking shoes and changed into my sneakers. I rested for a moment. The houses were all holding their soft glow. How many houses on the trip had I passed and they would just be houses with strangers inside, impossible to enter? But now I would see my own home and walk right in. I first saw my house, all done up in Christmas lights, through the woods of an adjacent street. When I pulled into the court, I did not feel nervous or jubilant just a quite notion of having arrived. The last stop waiting here the whole time. I rode up the drive way and into the garage. The dogs greeted me silently as if I had never left or maybe they didn’t remember me. My family had not seen me riding up the driveway, so I walked into the house and turned into the kitchen like I’d just come home from the store. Mom was in the kitchen straining her eyes to look at a can. When she looked up and saw me, she almost jumped out of her skin. Patricia was closest and wrapped me in an immediate hug. I hadn’t been home in a year. 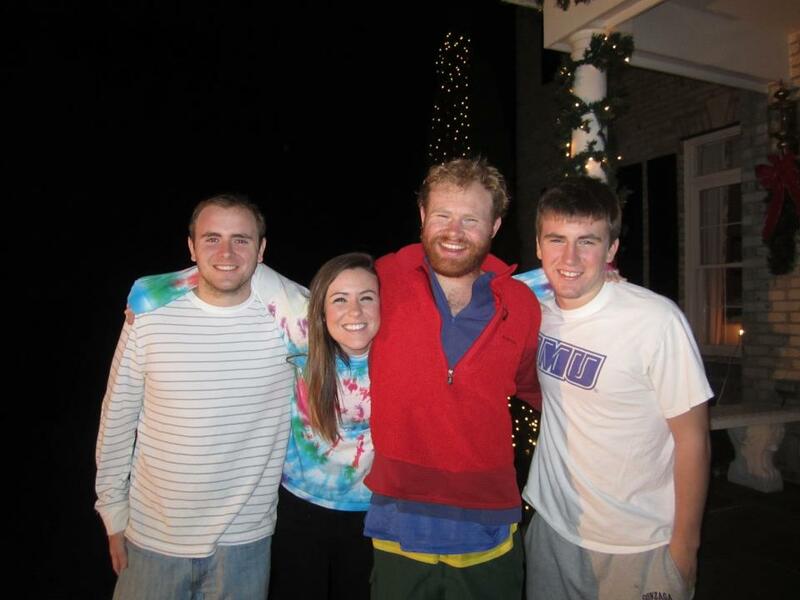 I hadn’t seen my family with the exception of my mom in just as long. After I showered, we ate dinner of veal and eggplant parmesan. Mom beamed the whole meal. I must have seemed like a ghost to my family. They all knew what I was doing, but unless you’re out there and doing it with someone, it’s a hard thing to really picture. For them, I was gone and now I was home. Home. I let that thought curl around my tired head, and felt the part of me that had kept its view on the horizon, the next town, the further distance slowly close its eyes and go to sleep. A rough map of the route. 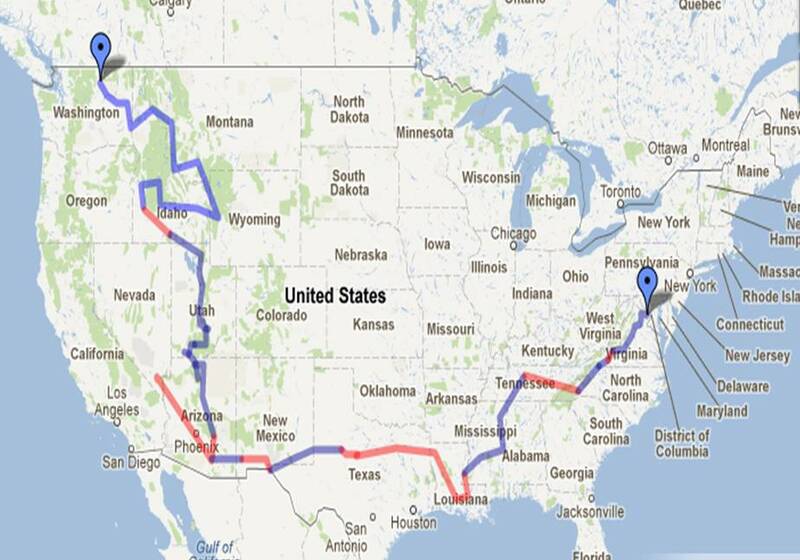 Blue lines indicate biked miles. Red lines stand for significant car rides. Six months ago, I turned the trip’s final pedal. That it’s taken me this long to get it all down is in large part sheer laziness. Another factor though, I like to think, owes itself to reluctance, a refusal to admit that it’s actually all over. The first day back home I had to struggle with the four month strong reflex of getting back on the bike. 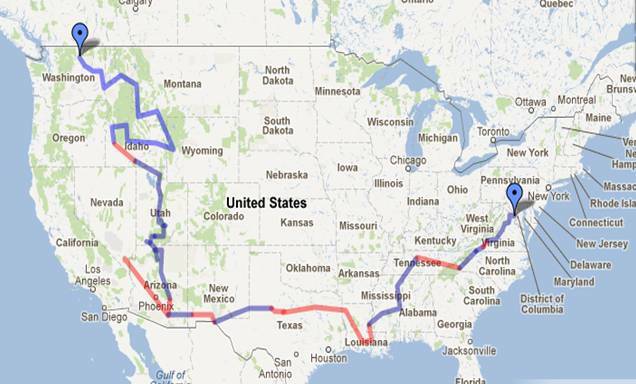 For 4,000+ miles through 13 states, I rode in the current of constant motion. When all that came to a stop, my mind still had itself stuck in a dead sprint and I felt a little like Wild E. Coyote treading through thin air before realizing that he’d run himself right out of ground. If the bike trip couldn’t last forever, I at least wanted its momentum to carry me right up to the next thing. I half expected one morning to wake up and find a ship docked in my front yard with the captain yelling All Aboard! I entertained pipe dreams of hitch hiking back West or an Alaskan backwoods romp, but had to admit these thoughts as desperate and grasping. They all seemed to try and reclaim some of the trip’s freedom, but even in their imagining seemed hollow. I met many full-time travelers on the tour, and their lifestyle made road fatigue a very real thing. Too many experiences like the bike trip can make the doer dead to the experience and turn the exercise of total freedom into mere routine. I didn’t need another adventure, just time to rest and catch my breath. Adventures take a long time to build. The desire for a bike trip had taken a life time in the making, and though I don’t think it’s my last, I wanted to give the next adventure a moment to gain form and intention so that when it goes off it does so with the same spark and brilliance I felt when pedaling out of Omak. These were not easy things to come to terms with, but two moments brought their truth into focus and gave me peace with staying put. The first was a dream I had on the trip. In the dream, I am coming home from the bike tour. I ride slowly through the woods with my family walking alongside me. Between the trees, I can see a big home and come to understand that the home is mine. Inside there is a large group of family and friends. Everyone is crowding around me, giving me warm handshakes and pats on the back. I am overwhelmed by all the people and the new house. It is too big for me and I wonder if all these people expect to live here too. I don’t get any indication whether or not this is the case, but eventually stop worrying about it. I begin to realize that this is a very big house, larger than I had first thought, and that this room with the party is only one room. Beyond it are other rooms, secret rooms, that open only to my touch. I want to stay here a while and explore. I had this dream around the midpoint of my trip and it gave me some comfort as I got closer to home and the what-to-do-now question loomed larger. I was going home and the dream assured me of a place prepared. In a way, that dream pretty much came true. I was fortunate enough to get part time work almost as soon as I stepped off the bike which eventually developed into a full time job. During the commuting hours of my first months though, I would remember the trip and how I had been removed from all this, blissfully out of pace with the world of traffic jams and stop lights. I wondered if this was the right place for me and if I should get back on the bike and find another highway. But a second thing happened around that time that put these thoughts to rest. I work in Tysons, VA and my office has a balcony patio with a good view of the Beltway. During my lunch hour, I can sit out on the balcony and watch the traffic lurch on like a log-jammed river. One day I went out to the balcony to watch an event. The Discovery Space Shuttle was being flown from Florida to the Air and Space Museum out by Dulles Airport. Its route passed right over my office. 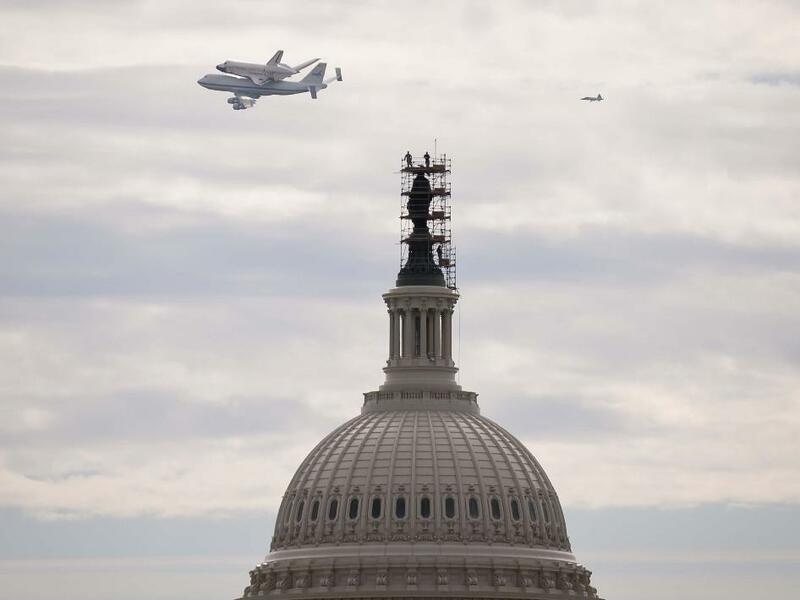 I saw the space shuttle strapped atop a 747 while it made a slow circle around the Beltway. On other building tops, I could see crowds of people watching the shuttle with their arms raised and pointing. This hunk of metal that had been to space and back now looked like a small child resting across its dad’s shoulders on their walk home from a long day in the park. After 39 successful trips and 149 million miles, the Discovery on its final flight home signaled the end of something. The end of the shuttle program, the end of my trip. It felt like a right and fitting finale. I had a thought: When all the frontiers are reached, you can turn to other places and find other worlds, closer, terrestrial, but still as undiscovered and new as those you’ve come from. So that’s where I’m at right now. Thanks to everyone who’s joined along for the ride. None of it could have happened without your support. The loaned gear, the couches, free food, rides from strangers and family all made it possible. Thanks for coming with and I promise to invite you on the next one! This entry was posted in Uncategorized and tagged Bike Trip, Discovery Space Shuttle, Dream, Home. Bookmark the permalink. awesome! your story was truly amazing! Good luck where ever life takes you! Thank you so much Richard for sharing your journey with us all, and for your reflections on being back. Your writing is beautiful and genuine. I am proud of you! Richard, may you continue to find beauty, love, fulfillment, and joy in the extraordinary and ordinary moments of the rest of your life. I love you and am blessed and lucky to have you as my son. Thank you for teaching me. Wonderfully written, Richard! I enjoyed following along on your adventure from my work cubicle and hope to someday make my own adventure. Good stuff Richard! I can’t wait for your next adventure. In the meantime, keep writing. I want to know what office life is like through the eyes of Richard!